Hi everyone! 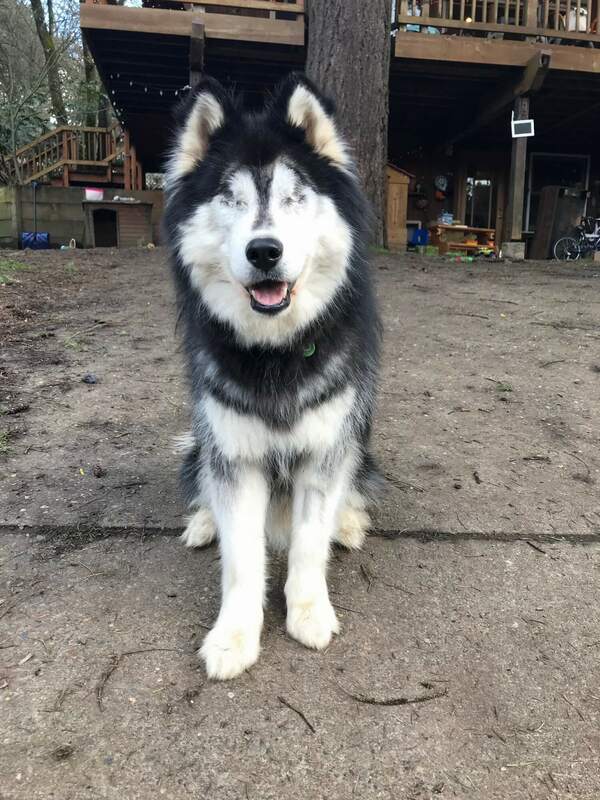 My name is Samson and I am a friendly and super cute ball of floof aka Malamute mix weighing in at 60lbs . You might notice I am missing something-well, 2 things to be exact: my eyes! Shortly after I was a young pup, I ended up developing cataracts which caused my to go blind. Long story short, I needed my eyes removed and man, do I feel much better! Since I have been blind most of my life, I heavily rely on my other senses and am easily able to adapt to new environments, but do need an owned home. I am such a friendly active oaf that loves being around friends. Whether its my doggy pals or humans over 10, I enjoy lots of pets and will reciprocate with lots of kisses! I am a little too interested in kitties, so none in my home please. When I am not enjoying some nice back pats, my hobbies include playing in the snow and playing with my favorite squeaker toys! Confident, loving, and down right hilarious, I am a handsome dude looking for my new companions. Will it be you? Fill out an application today, so we can meet. I come to you vaccinated, micro-chipped, and neutered with an adoption fee of $350.